A delegation from the Qatar 2022 World Cup Organizing Committee led by Secretary General of the Supreme Committee for Delivery and Legacy Hassan Al Thawadi paid a visit to the Russian House in Davos, where he held a working meeting with the Roscongress Foundation. One of the main topics of discussion was Russia’s successful World Cup. 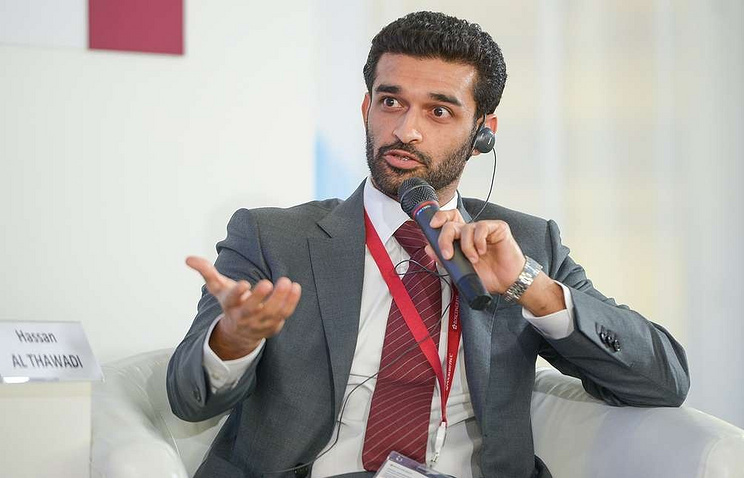 Hassan Al Thawadi compared the level of organization of the World Cup to the St. Petersburg International Economic Forum, which he visited in May 2018. “After my visit to the St. Petersburg International Economic Forum last year, I had no doubt about the quality and success of the World Cup in Russia. They know how to organize large international events in this country; there are many successful examples of this. Working together with Russia to prepare competitions in Qatar will help us not only learn from Russia’s experience but also to add our own national traditions of oriental hospitality in order to hold a memorable global event,” he said during the negotiations. Special attention was paid to possible areas of collaboration for the Roscongress Foundation and the Organizing Committee of the Qatar 2022 World Cup in the preparation and holding of competitions. Qatar is likewise interested in learning from Russia about security for the Championship. Russia and Qatar are long-standing strategic partners. Over the past few years, the countries have successfully collaborated in many sectors of the economy, science, and culture. 2018 was declared the bilateral year of culture for Russia and Qatar, and 42 events were held on 11 different themes including music, literature, theatre, sports, and technology. Events took place in Moscow, St. Petersburg, and Kazan as well as in the Qatari capital Doha and other cities. Last December, a meeting took place between Adviser to the President of the Russian Federation Anton Kobyakov and Ambassador of Qatar to Moscow Fahd bin Mohammed Al-Attiyah. Special attention was paid during the meeting to the participation of Qatar at SPIEF as a guest country in 2020. In 2018, an official delegation from Qatar that included representatives of a number of ministries and departments as well as major businessmen took part in the St. Petersburg International Economic Forum. The St. Petersburg International Economic Forum will be held from 6 to 8 June 2019. The Qatar World Cup will be held from 21 November to 18 December 2022. Russia House is a platform for the promotion of Russian initiatives among members of international business and official circles that gather in the Swiss city Davos for the World Economic Forum (21–25 January 2019). The result of long-term cooperation between the Roscongress Foundation and the International Organisation for Public Private Partnership World Economic Forum came in the form of the signing of a memorandum of understanding at the St Petersburg International Economic Forum in 2017. That year Russia House took on the status of an official Russian representation. Roscongress Foundation is a socially oriented non-financial development institution and a major organizer of congress, exhibition and public events.